This past weekend I had the privilege of participating in the NBA Canada Series in Vancouver presented by Bell. The NBA Canada Series was created to allow Canadians outside of Toronto the opportunity to attend and experience a Toronto Raptors game live. Canadians love basketball and millions of people play the sport across the country and tune in to watch the NBA. Currently our Women’s National Team is ranked 5th in the world and the Men’s National Team is ranked 23rd. With the upcoming young talent, our rankings should continue to rise over the next few years. Shawn Marion, Myself, Tamera, Mariah and Raptor. Photo courtesy of NBA Canada. Along with the Raptors game, there are partnership events that take place as well, that I was fortunate to take part in. I flew in to Vancouver Thursday morning, and that afternoon I was headed to Sir Charles Tupper Secondary School for their Kids Code Jeunesse event. I was joined by Shawn Marion (Former NBA player, All Star and Champion), Mariah and Tamera (Toronto Raptors Dance Team), Christian (NBA Basketball Operations and Events), and of course the Raptor! Photo courtesy of NBA Canada. Kids Code Jeunesse is a Canadian Non Profit organization dedicated to empowering children and educators, with a focus on girls and children from disadvantaged groups, with the skills we all need to thrive in a technology driven society. By brining digital learning experiences into the classroom and in communities, they teach Canadians how to be better thinkers and better creators in a digital world. Christian in his element, sharing his love of the game with the kids! Photo courtesy of NBA Canada. My awesome wristband, who wants to play? The event began with video introductions of each of the guest, followed by a Q&A where the students asked some well thought out questions. The questions included: What skills did basketball teach you that you use in your everyday life? And, what are some important life lessons that basketball has taught you? The questions were followed by the students giving us gifts of ‘rock, paper, scissors’ wristbands (pictured) that they coded, designed and created themselves! Afterwards there was a mini basketball clinic, and dance session put on for the high schoolers, while the younger students were at their coding tables creating new games! A few tables were coding a basketball game, and programmed their cup (their make shift basketball net) to recognize when a shot was made (when their play dough basketball landed in the cup). To say the very least, I was very impressed. If I can be honest, I was a bit envious as well, I wish I had classes and programs like this when I was a kid! Packed house at Sir Charles Tupper Secondary School. I am a big kid at heart. Having fun with future coders of the world! 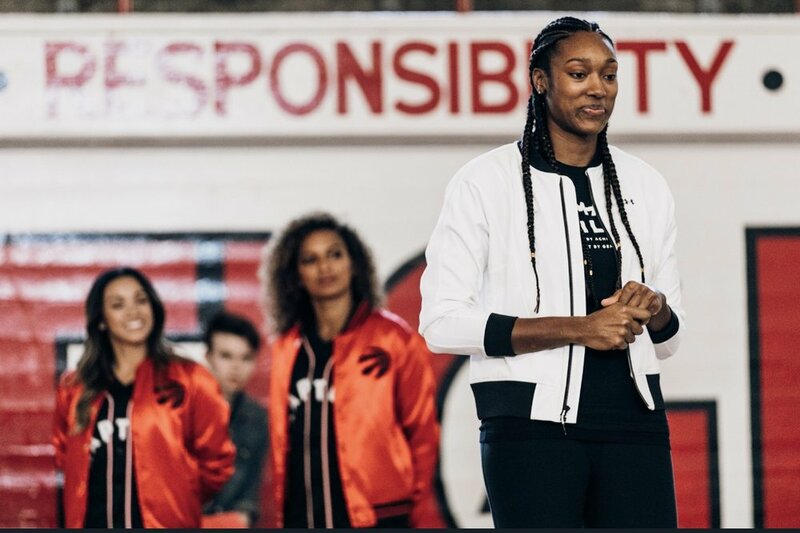 Overall it was an incredible afternoon, and I want to give a big shout out to NBA Canada for partnering with Kids Code to put on this event. I also want to recognize all the staff, faculty, teachers, and coaches who helped make this possible for all the students. Last but not least, I want to recognize the students, who were so eager to participate and educate me in coding! I had such a great time interacting and speaking with them, such a talented and intelligent group of kids. The future is bright! To see more of my time in Vancouver for the NBA Canada Series be sure to check out part 2!